Last Friday evening, I once again found myself chased by the dreary lashes of rain into the warm embrace of another Madrid for Refugees Chefugee dinner. This time, I was greeted by comfortable canvas chairs gathered round long tables being carefully laid by busy volunteers. Vast dishes holding an enticing display of colourful foods from across the world sat in anticipation of the curious stomachs they would soon satisfy. Chefugee Old World was ready to begin. This evening involved a twist on the familiar Chefugee proceedings. 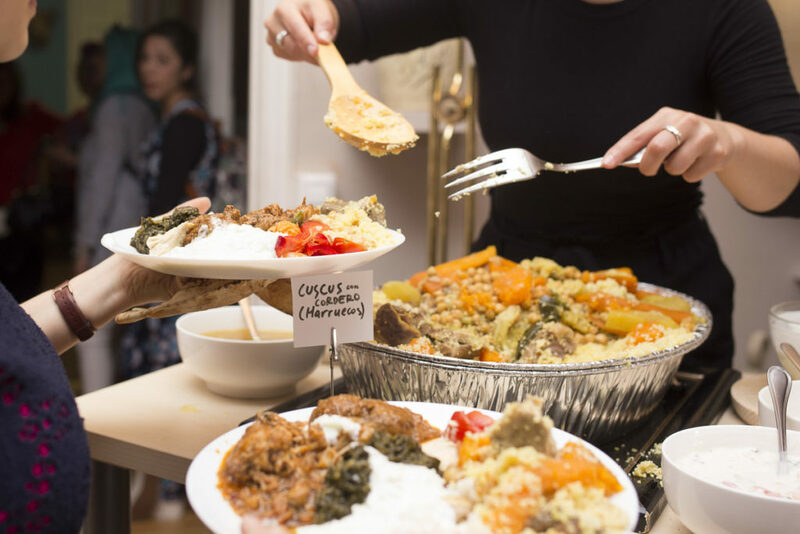 As usual, paid refugee chefs showcased their culinary prowess to paying diners in the delectably heart-warming cultural sharing experience Chefugee always is. Tonight, however, we were gifted a slice of history in the so-called Chefugee Old World. The chefs all hailed from culturally rich regions that once made up lands like the Fertile Crescent and the Silk Road, our taste-buds were thus taken on a tour of ancient civilisations and culinary traditions. 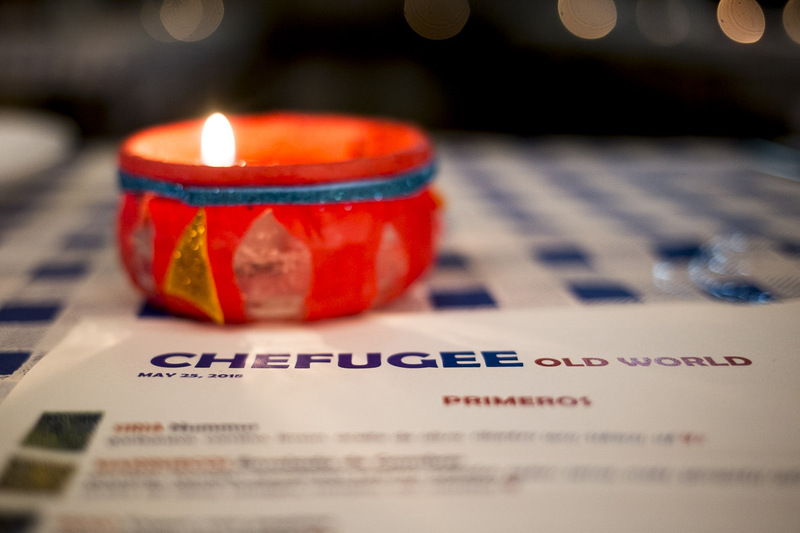 This was also the inaugural event in Chefugee’s new permanent home at El Gabinete. A former museum recently re-opened as a shared eco-working space, it provided the perfect complimentary backdrop for the historical theme with a vast collection of peculiar artefacts cluttered across the walls beckoning us back in time. The night’s line-up included a diverse, skilled, and ever-smiling team of chefs. Rachida, from Morocco, had fled Syria with her husband and brought with her a dynamic skillset having been a commerce manager in Morocco and a French teacher in Syria. Representing Iraq was Eshrak, a mother of six with an economics degree to boast. 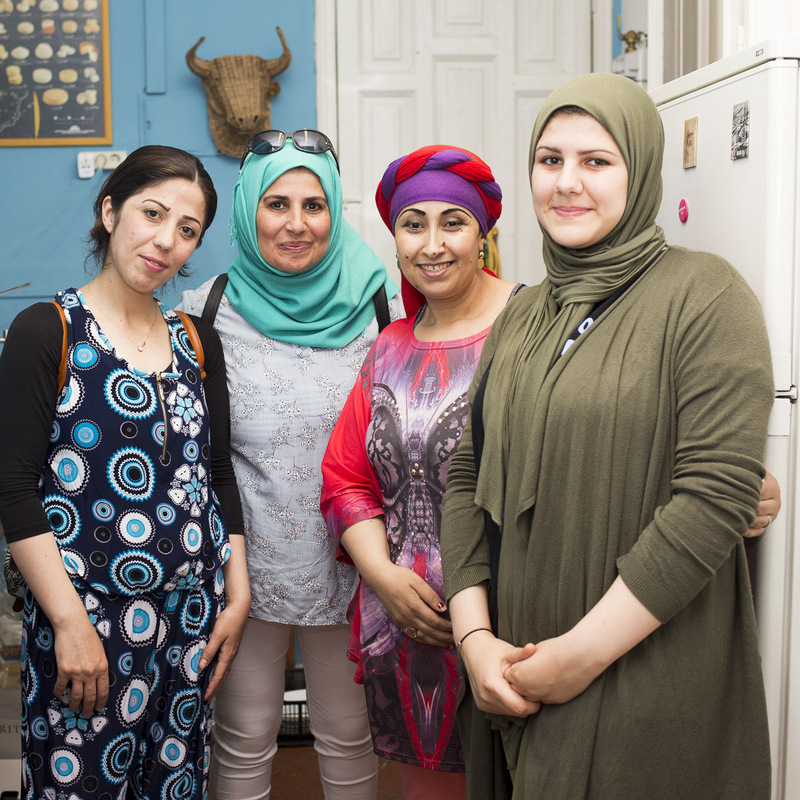 Joining them was Usma, a young talented Afghani chef who has recently acquired a job in a Turkish restaurant, and Hevin, who has only just arrived from Syria with her husband and young children. They presented a menu that might have been a page torn from a history book with each dish marinated in tradition. 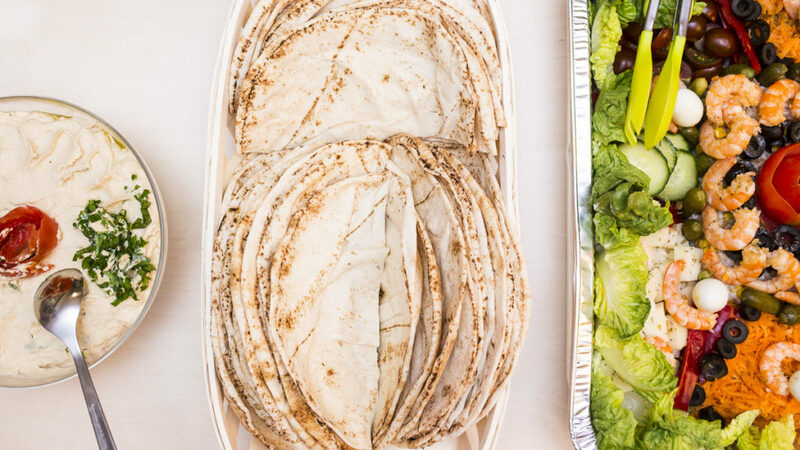 We were able to choose from a wide tantalising selection of expertly executed favourites such as Syrian hummus or the refreshing Iraqi yogurt and cucumber dish, and adventurous new flavours like Afghani chicken meatballs and a Moroccan prawn salad. The mesmerising variety of choice was praised by everyone present; “the mixture of known and unknown is amazing, and it’s all so tasty!” exclaimed one satisfied soul. The new home, El Gabinete, also lent itself effortlessly to Chefugee. After two years of ever-changing locations the space will finally provide, as Natalia explained, “a nice ‘grounding’ feeling” for Chefugee. The large open space provides the perfect pot in which the wonderfully diverse ingredients of this event can boil over into the fluid integrating occasion it sets out to achieve. A warm bubble of conversation occupied the room as the 40 guests were served dessert. It was clear that once again Chefugee had achieved that good food experience it always aims for. Whether that be through helping the chefs develop practical skills as Eshrak explained how she had “never cooked for so many people before, it’s great practice”, or, in the words of Rachida, by opening “new doors, and giving me something new, something fresh”, and all whilst guests were able to explore an array of ancient flavours. Those present were quick to praise this refreshing community occasion, one diner described how he was “touched” by this “amazing event where integration is achieved through cultural sharing.” And we of course must not forget to applaud an invaluable ingredient of the evening, the diligent work of the volunteers who were present long before and long after any plate was filled. As the chefs bid their farewells to the guests, Hevin, through her translator Lina – Eshrak’s gifted daughter – graciously told us “what’s most important is that you enjoyed the food.” The selflessness of these words was equalled only by the gratitude of the guests as a round of applause erupted assuring all the chefs that the food had most definitely been enjoyed. 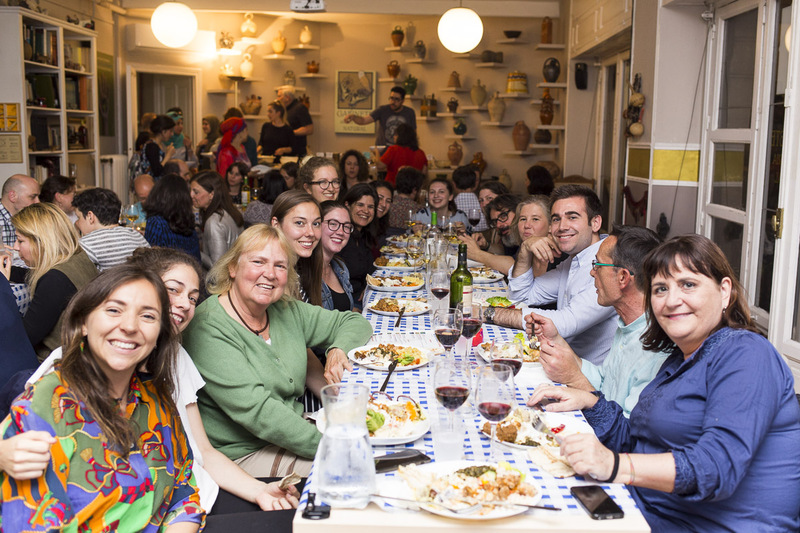 While this night may have drawn to its conclusion, your chance to participate in such a delicious culturally-aware occasion has not; coming up in June is the Refugee Food Festival which will involve an entire week of Chefugee! More information will be released over the next week or so, both on social media and here on this blog, make sure you don’t miss out.